JMS has been active conducting stability tests for a wide variety of ship types. Stability tests have been conducted aboard offshore supply vessels, passenger vessels, and deck barges this past year. 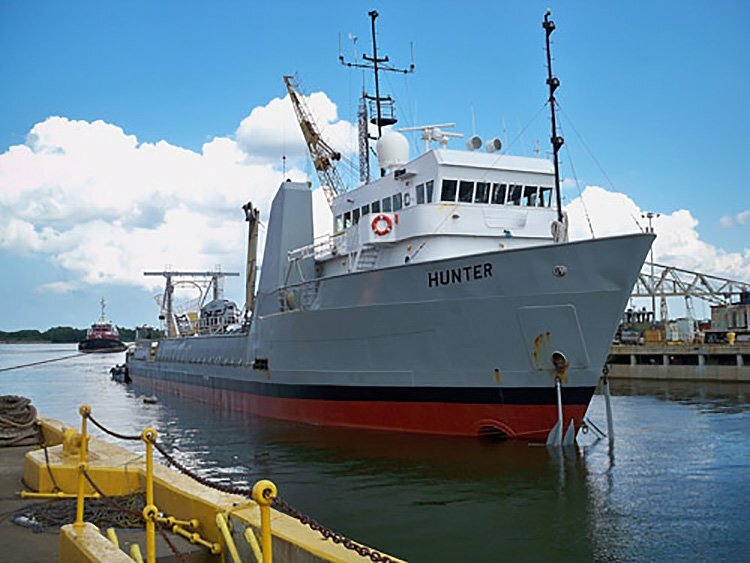 N/S HUNTER is a 180ft offshore supply vessel, owned by the US Navy and operated by Seaward Services. JMS performed an inclining test at Detyens Shipyard in Charleston, SC. The broad aft deck of the vessel facilitating location and movement of the inclining weights and the location of the ship in the graving dock made for a text book inclining test. JMS conducted a deadweight survey on the 80ft passenger vessel FIRE ISLAND BELLE to demonstrate to the US Coast Guard that she is a sister to several vessels of the same design built by Blount and operated by Fire Island Ferries. JMS performed the original stability calculations and test in 2001 on the FIRE ISLAND FLYER. PRYSMIAN 1 is a 300ft cable lay deck barge. It was built in China and originally registered in Panama. The vessel transferred to a US flag, but in order to qualify for a US load line a revised deadweight survey was required. Because of the large amount of equipment on board and the location of the barge, it was impractical to remove all of the deadweight items. JMS worked with the local ABS surveyors and the owner to quantify those items remaining on board, including several thousand meters of cable. JMS conducted a stability test on board the 26′ ex-Navy motor whaleboat SPIRIT OF AMERICA in order to perform detailed calculations for a USCG approved passenger capacity. The vessel had undergone a Simplified Stability Test but the conservative results seriously limited the owner’s water taxi operations. The small size and fine form of the vessel made the inclining test very sensitive to any movement of weight including that of the personnel conducting the experiment. With care and precision, JMS was able to obtain excellent test data, resulting in an increase of several passengers for our client.